I have to tip my hat off to AT&T and Cricket for coming up with these new cell phone plans. Cricket today announced some great new offerings and raised the bar in terms of the amount of data offered per dollar per area covered by a network. No other MVNO or carrier can match Cricket's new low cost offering of $35/month with autopay enabled for unlimited talk, text and data with the first 2.5 GB being LTE. Previously the plan only contained 1 GB of LTE. Data still gets throttled to 128 kbps once you go over your high speed allotment. We recently profiled the cheapest prepaid providers that offer the most amount of data for $35 or less. If you read over that article you'd see that while there are other providers that offer at least the same amount of data for the same price or less than Cricket's new plan, none of those offerings can come close to matching Cricket in terms of network coverage. The only catch here is that most of those other plans offer true LTE while Cricket is throttling download speeds to 8 Mbps. Upload speeds however are not throttled. For a majority of users, throttling to these speeds will go virtually unnoticed. 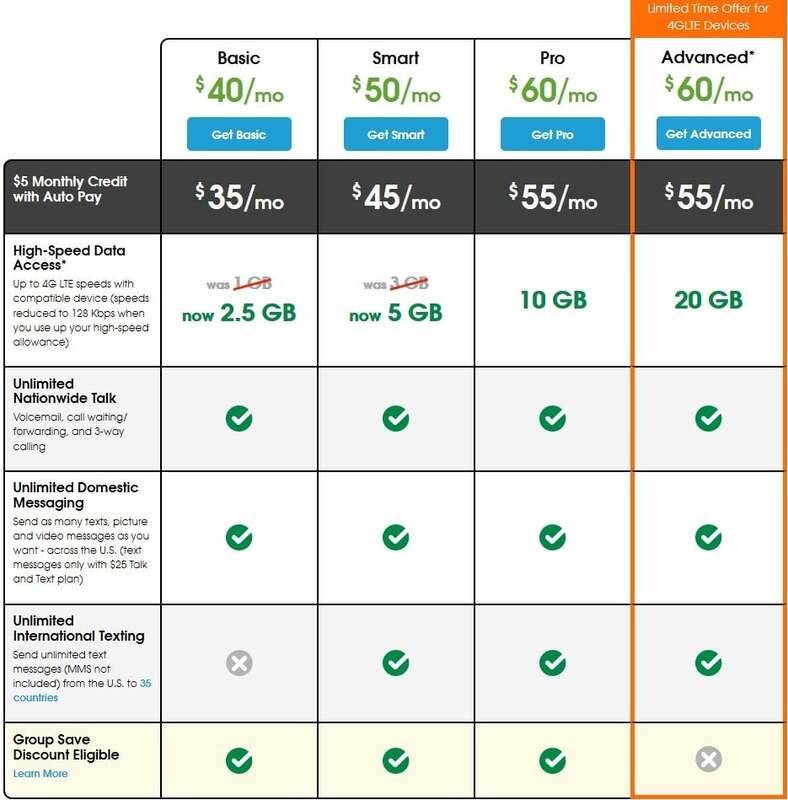 Cricket also upped the amount of data offered on its $45 (with autopay) plan to go from 3 GB to 5 GB. This also puts Cricket among the top prepaid providers that offer the most amount of high speed data at that price point. Cricket also revealed a new plan for data hungry users which offers 20 GB of high speed data a month for $55 (with autopay). Aside from plans that offer unlimited data, this makes Cricket the king of value at and around this price point as well, although this is a limited time only offering. So what do you guys think? Do these new plans make you want to switch providers and or pop a Cricket sim into your phone? Cricket really wants you to make this switch so they've put some phones on sale and are even offering the Nokia Lumia 635 for free after mail in rebate. If you switch and stick with them for at least two months, they'll give you a free month of service as long as you are subscribed to either their smart, pro or advanced plan. Unfortunately the free month of service is not available to those of you transitioning over from ATT. A bit of advice for those of you interested in the $35 plan switching over from another provider, you may want to start off on the $45 plan to get a month of free service before switching over to the $35 plan, you'll save $15-20 that way after the 3rd month.